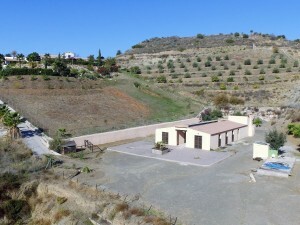 A semi renovated cortijo situated just outside the town of Albox. This town of Albox is only a 10 minutes drive where you can find all amenities for your daily life. The beaches of Almeria can be reached within a 40 minutes drive. The house has a good tarmac access and another access which is closer to the plot. 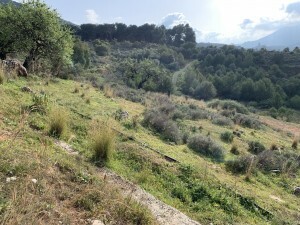 The land of 5800 m2 is surrounded by 3 sides of the house and is planted with figs, olive and almond trees. Through the front door you enter the house to the living room with a chimney. To the left there is a hallway with 3 bedrooms, a bathroom and the kitchen (not fitted). At the end of the hallway there is the huge garage with a chimney which can be converted in more living space. Back to the living room straight ahead there is the dining room with a staircase to the second floor. This floor already has a new roof and this was designed to be the master bedroom with a bathroom en suite. The structure of the house is good. In front of the house there is a huge patio where you can enjoy the amazing views. There is already a renovation permission. This house needs work, but the structure is good. 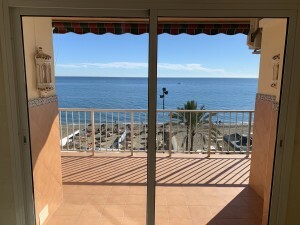 This property can be an amazing beautiful situated home! For more information or a visit, don`t hesitate to contact us!